I was looking at wedding music statistics today (as you do) and found these one’s to be pretty shocking. Statistics I found on the St. Louis Bride and Groom website, taken from sources such as USA Today and The Knot suggest that almost 100% of brides they spoke to would, if they could do things again, spend more money when it came to choosing the entertainment for their wedding. 72% of those brides said they would spend a significantly larger amount of time choosing their musical performers. Finally 81% said that the main thing they remembered about their reception was the entertainment they chose. Choosing a Scottish wedding piper for your wedding can be a time consuming business but these statistics definitely show that it will be time well spent. Don;t leave it until the last minute and don’t underestimate the importance of getting a really good piper to play. We can recommend Stuart (who can be found here: http://elitebands.co.uk/scottish-piper ) however if you have anyone you’d like to recommend make sure to do so below in the comments! 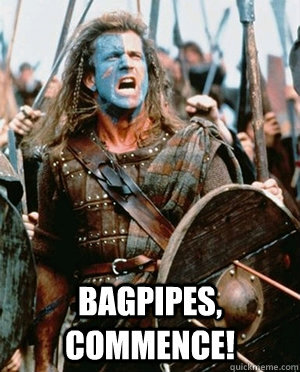 ← More famous songs covered on bagpipes.